I've been busy trying to get this cute little box of 3x3 cards finished this week! I love the Wicked Cool stamp set! Check it out! There's a tiny bit of room for a tiny little pen to the left of these little cards. I think I found the pen at a local office supply store. The box holds 4 3x3 cards and their envelopes. 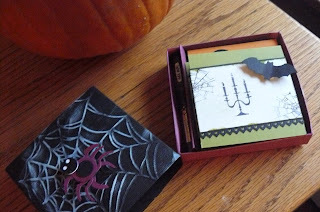 The box has just a simple slide cover that I embossed with the new SpiderWeb embossing folder in Stampin' Up's Holiday Mini Catalog. 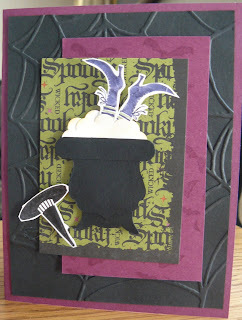 I swiped it with some white craft ink, mostly so my spider would show up LOL! To make the spider, I used a tutorial that I found on Stamper's Connection from Jackie Topa (one of the queens of punches!). These spiders are a bit different from last year's spiders (that used the photo corner punch) because the legs are actually made from the bat punch. I hear y'all saying, "How'd she do that?!" To make the legs, punch out one bat, slightly move up your punch to the top of the punched area (which results in just a sliver of legs, as long as you move it up enough -- if you don't, the bat "ears" and the newly attempted bat "sliver" will result in 2 legs rather than one set of legs if that makes any sense! LOL!) The body is a 3/4" circle, and the head is a 1/2" circle -- for the head, use your cropadile to punch out 2 eyes in a black 1/2 circle, then layer a white circle underneath. Here's a better view of the 4 cards in my little box. Accessories: Punches: 3/4" and 1/2" round, Pinking Hearts Border, Bat Punch; Cropadile; Big Shot and SpiderWeb Embossing Folder. Thanks for visiting today! Visit my online store HERE if you need any "scary sweet" supplies for Halloween!! I love Fridays! I should amend that to say that I love Fridays when I'm not working the weekends! LOL! But, today I love Fridays because it's time for the weekly Blogger's Challenge! 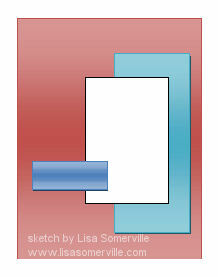 Today's challenge was a color challenge: to use blue, green and brown. My go-to color combo is Stampin' Up's Marina Mist, Pear Pizazz, and Soft Suede, so you'd think that this would have been easy, right? Wrong ... I made 3 cards before I was finally satisfied with my card LOL! I have to say that I do indeed love this card! The base is Soft Suede, and then I matted the white textured image with Marina Mist. The stamp set for my image is the Level 2 hostess set Fast & Fabulous. I used markers to color my stamp, then used my ink pads and blender pens to color in the flowers. The centers of the flowers were originally pearls, but since I was "pearlizing" my butterfly, I decided to "glitterize" my flowers. I used one of the fine cosmo glitter colors, probably the turquoise color. Do you know what happens when I get into glitter?! "Uh Mom, you have glitter on your cheeks." " You have glitter in your hair." "Uh Mom, what's that sparkly stuff all over your clothes?!" "Uh Mom, have you been playing in the glitter again?!" Yep, that's what I'll be hearing for the next 12 hours. It doesn't even come off in the shower!! LOL! Accessories: Finial Press Textured Embossing Folder, Big Shot, Beautiful Wings Embosslit, silver brads, Eyelet Border Punch, Turquoise Fine Cosmo Glitter with glue pen, Marina Mist 5/8" Satin Ribbon (I used the Bow-Easy that my sister generously hooked me up with! ), Basic Pearls. Thanks for looking! If you need any supplies to duplicate this or any card, visit my online store HERE! Two New Card Kits Available ... While Supplies Last! My upline, Marilyn, and I have been working hard to design TWO new card kits for you all! The first kit is made with the Tea party Designer paper which is retired, but we have a few sheets left (just call us hoarders) and are willing to share them. We have a limited number of kits since the paper is retired...you might want to hurry!! 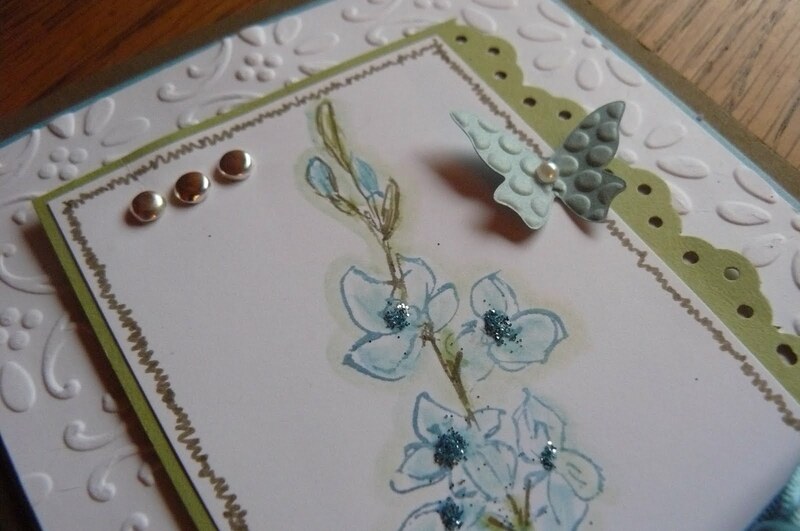 The kit is made with the stamp set - Flight of the Butterfly.This was one of the first stamp sets that I purchased when it was available a few years back! 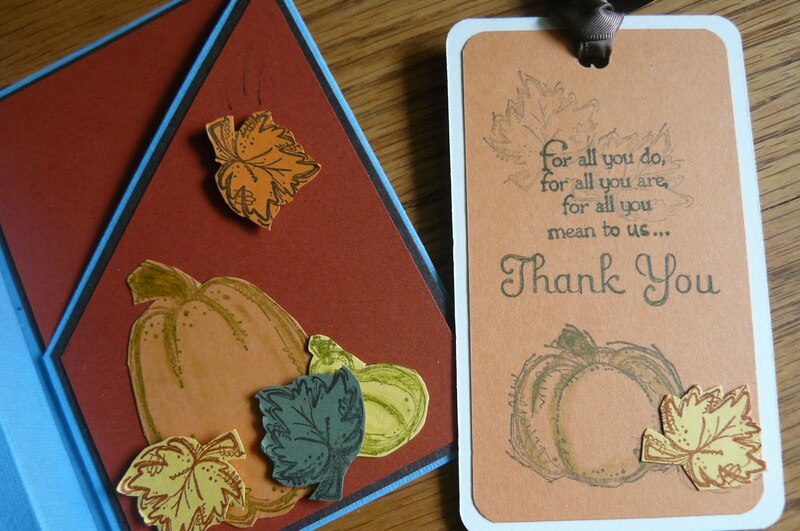 The kit is $20 and includes all of the pre-cut cardstock, layers and embellishments to make 12 cards. Envelopes are included with full instructions for these cards. The kit also includes (6) 6" x 12" sheets of Tea Party designer paper, so you will have lots of this beautiful designer paper left when you are finished making the cards in the kit. If you don't have the Flight of the Butterfly set, it is 10% off with purchase of the kit! Just email me or give me a call. 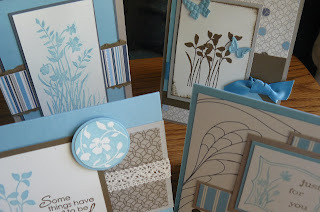 This card kit is made with the new designer paper Elegant Soiree. 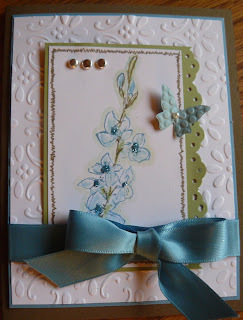 I just love this new paper and this new stamp set!! The colors are beautiful!! Delicate enough for a wedding card, but masculine enough for the important men in your life. A few touches of crocheted trim and you have a vintage look that even your grandmother would love! 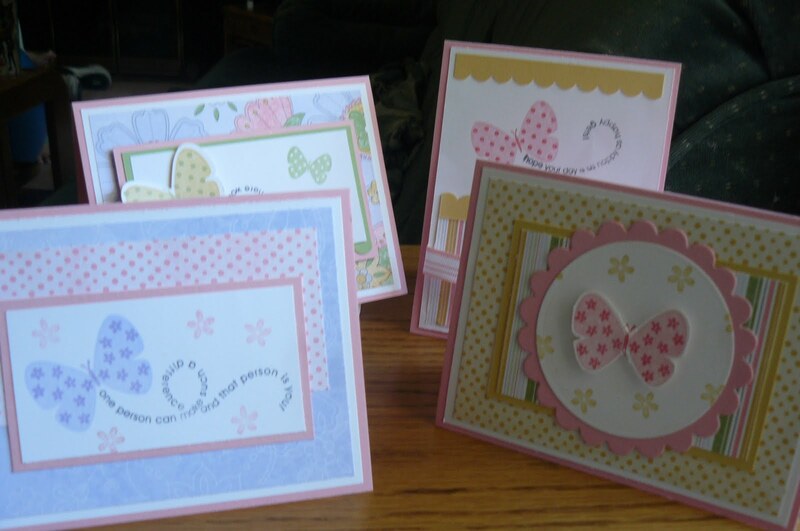 The Kit is $22 and includes all of the precut cardstock, layers and embellishments to make 12 cards. Envelopes are included with full instructions for these cards. The kit includes (6) 6"x12" sheets of Elegant Soiree designer paper, so you will have lots of this beautiful designer paper left when you are finished making the cards in the kit! And... the stamp set Just Believe is 10% off with purchase of this kit! What a great deal!! You can call (781-771-0849) or email me (jvn89@aol.com) for more information or to place an order! A Fall Treat for Someone Sweet! 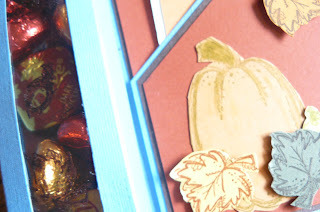 For this week's Blogger's Challenge Group, we were challenged to make a fall-themed card. 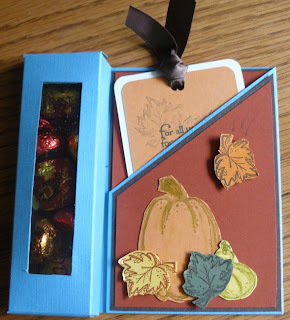 When sorting through my emails today, I had received a free tutorial from Pockets of Inspiration for a Treat Box Card. You can get your free tutorial here. I decided to make use of this cool template immediately since it is the birthday of one of my dearest neighbors. Happy Birthday Lou! He's always going above and beyond for our family, and for the neighborhood in general so I decided he needed a "special" birthday card. I bet you can guess why it's called a Treat Box Card, huh? Beyond the template, I had to make some intelligent guesses about how to make this into a card. I think if I had left the inner edge of the card unattached, the card would probably stand up on its own ... but I won't know that today since I sticky-stripped it after cutting it on the diagonal so I could include a bookmark (I think he's told me several times that he likes to read!). I saw a similar color combination used by Ilina Crouse in the past few days and I absolutely love the Marina Mist color! I don't usually turn to Cajun Craze but it looked good for her, so I made it work for me! The stamp set I used is Autumn Harvest. I just love the "whimsical" images (they look to me like someone was doodling and loved what they made, turning it into a stamp!) and find myself using this stamp frequently. Check out the bookmark below. I stamped birthday wishes on the other side of my bookmark, but I only took a picture of the front. Lastly, I needed to package my treats. 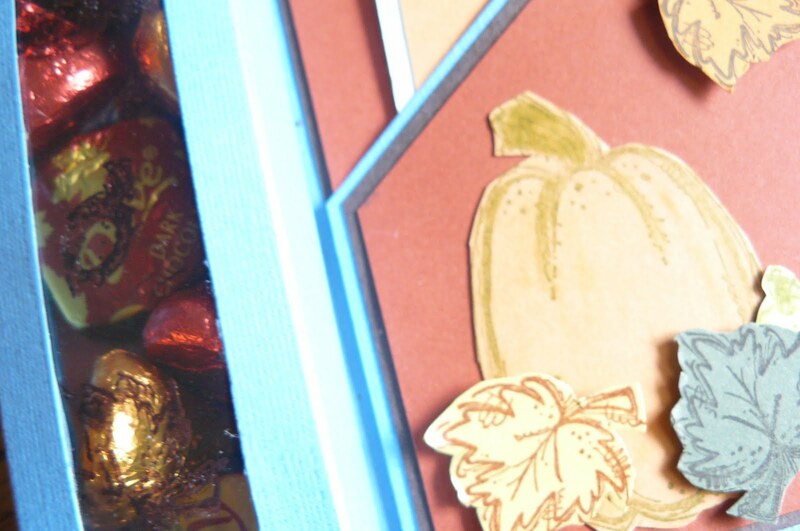 I cut a window out of my "box" and attached a scrap of window sheet to the inside after I stamped it with Chocolate Chip ink and embossed it with clear powder. It doesn't show up so well in the photo, but it's there! Inside, I included a handful of Hershey's Kisses and Dove Dark Chocolates. Yum! At the top of my box, I added a scrap of Marina Mist to the already-included-in-the-template box flap, just so the box could be opened without destroying the card/box. Thanks for visiting me today! I've enjoyed sharing my creation with you! I'm a little late with this week's Blogger Challenge! A sketch challenge this week! Now, I'm usually not very good at sketches, although I'm trying to think outside of the box more and more now! 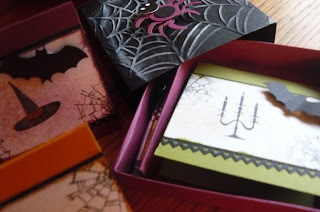 With Halloween coming, and my customers asking for Halloween cards and projects, I figured it was time to get going on some cute Halloween cards. Check out my card! Pretty close with an imagination, right? I'd better get my admitting out of the way right now! I'm guilty of case'ing! I got the idea of the witch in the pot from Sandi MacIver. I loved it as soon as I saw it! I guess we both have some sick, distorted sense of humor, huh? I changed it up quite a bit though, and adapted my cauldron from Ink,Paper, Stamps -- she had a neut/eyeball in her cauldron, which I also loved! 1. 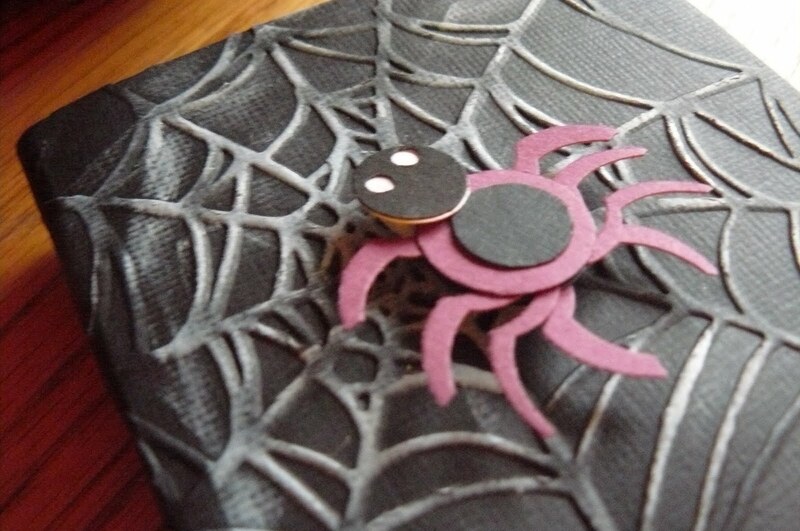 Don't have any Halloween Designer Paper??!! Make your own! 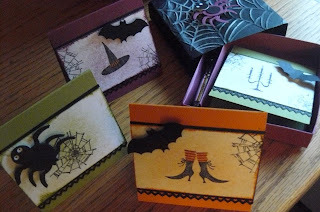 Stamp Halloween images with VersaMark Ink for tone-on-tone "handmade" Designer Paper like I did for my bats on the Razzleberry Paper! Want a darker, clearer image? Stamp your Halloween image with same-color ink on your paper (i.e. Rich Razzleberry ink on Rich Razzleberry paper). 2. Try to think outside of the box with your sketches -- I'm no expert, but initially I saw a sentiment or ribbon here on the left side of the sketch -- this time, I put the witch's hat there -- right or wrong? The sketch is yours to do what you want with it! Have fun!! Tools: Big Shot and Spider Web Textured Folder, Matchbox Bigz XL die, punches (word window, two step owl, scallop circle); dimensionals.